No tag. No known provenience. In same bag as KTH264. Fr. a: Spike with thick shank square in section; circular, flat head. p.L. 0.023, Diam. head 0.036 m.
Fr. b: Thick nail with shank square in section; thick, slightly raised, rectangular head. p.L. 0.047, max. W. head 0.023. Fr. c: Nail with thin shank; polygonal head slightly raised in middle. p.L. 0.036, max. 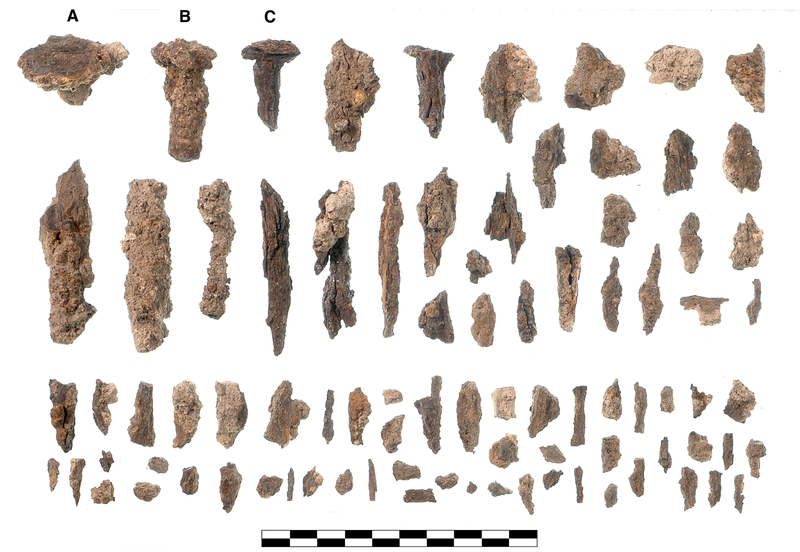 W. head 0.023 m.
Three large fragments (a-c) of nails preserve heads and small parts of shanks; 31 more fragments of shanks from small nails and spikes (MNI 3); and 53 very small fragments and flakes from similar objects. Moderate to severe corrosion and splitting.